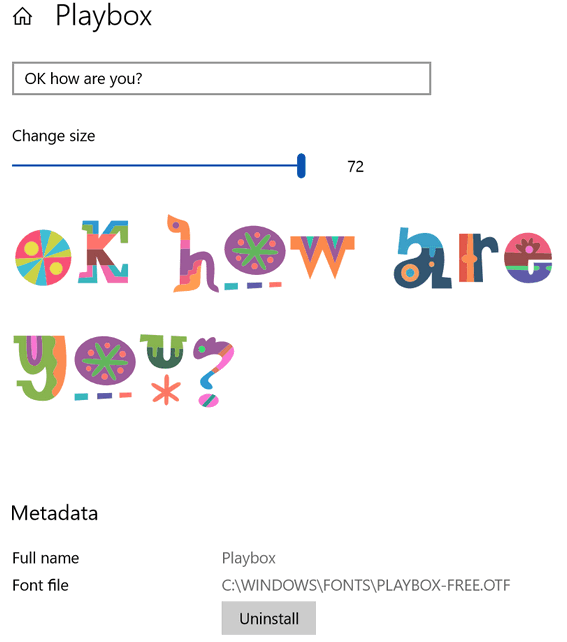 Not much changed in the way Windows 10 displayed fonts, until Windows 10 April 2018 Update (Version 1803). Until now, it’s been pretty much the same old, same old. But not anymore. Maybe you haven’t noticed yet, but starting with Windows 10 version 1803 (April 2018 Update), Fonts has been improved and moved in to Settings. You can find Fonts in Settings > Personalization > Fonts. If you haven’t seen it before, you’ll love the way fonts are displayed. 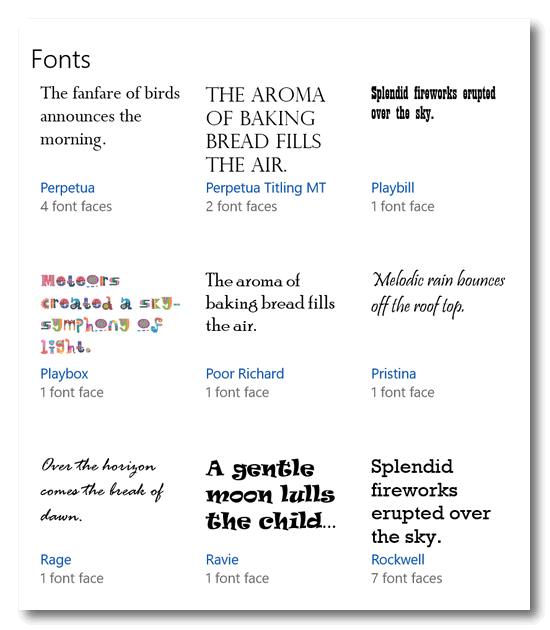 Now you can see your fonts at a glance, and really get a good close up view. 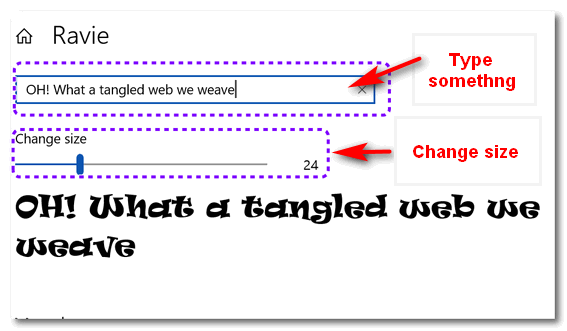 You can even type a word or phrase to see what the font really looks like. And you can use the slider to change the font size in the font preview. 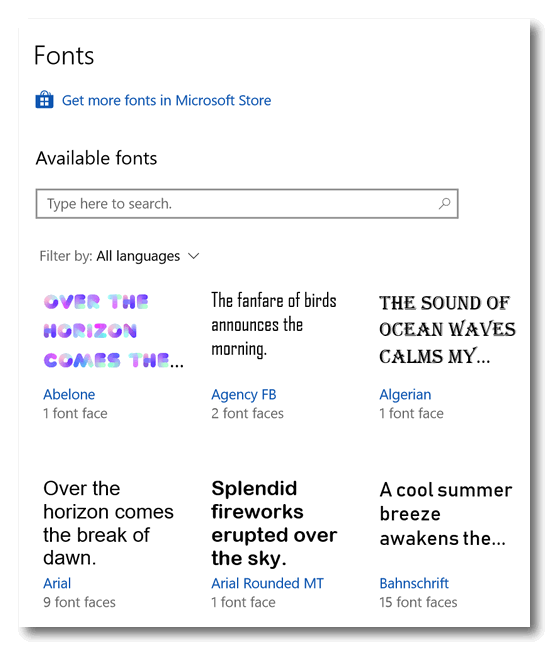 Fonts in Windows 10 Version 1803 and newer is a big departure from the old way of viewing fonts in Windows. And, you can also easily uninstall fonts from Fonts in Settings, but make sure you’re sure what you’re deleting. If you delete fonts used by Windows, you could be setting yourself up for some hard times! Oh, some of you really do have eagle eyes, don’t you. You noticed the color fonts! If you’re interested in learning more about this relatively new technology, please take a trip to the Color Font web site and read more about them, what applications support them, and even download some free color fonts to play around with. Color fonts are still mostly a novelty, but it’s not hard to imagine that within as few years, color fonts will be all over the Web on Web sites, Facebook posts, blogs and – of course- advertising. I’m having trouble getting my Windows 10 Ver 1803 to install or come up with the same directions to get to something like Fonts. Can you help me with this?